Readers of this blog will know I love the date 'n' orange combination. 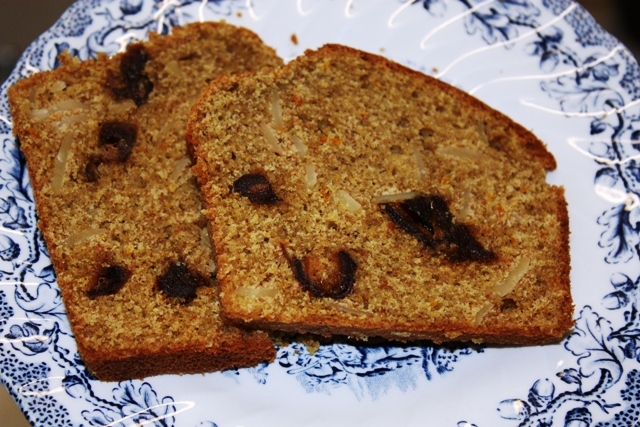 This is a sweet, orangey loaf that is very simple to make. I used an electric hand mixer but if you have strong mixing arms, it's not essential to use a mixer. Lightly grease and base line a 900g/2lb loaf tin. Beat the sugar and marg until smooth and creamy. Add the yogurt, orange rind, juice and eggs. Mix well. Add the flour and sieved bread soda and beat on low speed. Add the dates and nuts and gently stir until well mixed. Transfer to the prepared tin. Bake for about 55 minutes until skewer comes out clean. Allow to stand for 10 minutes, then transfer to wire tray to cool.